Grocery shopping for a family of four takes me, on average, about two hours. Wandering through the store is a major portion of that time. People kept telling me to use a map of the store. But I still had to look at the map and determine where each item was located. And the map included so much irrelevant stuff! Step 1: Mark down aisle numbers as you shop. I brought my grocery list to the store (simply jotted in my planner) and as I picked up an item, I wrote down the aisle number. Step 2: Make a simple table in Word or Excel of the aisles with your old, marked up grocery list. TIP: Divide it into dry and cold food. Step 3: Insert the items that you bought into the proper spot. Oil is on Aisle 5, for example. Now, when I make my grocery list, I can refer to this list. 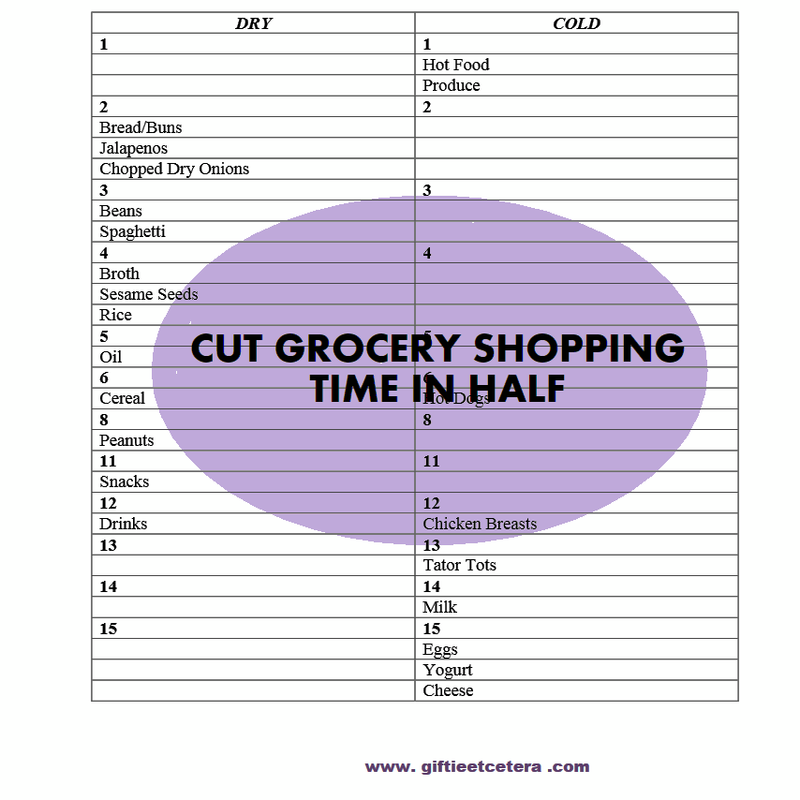 Step 4: Set up your new grocery list (either in your planner or on a printout of this custom map) by aisle. TIP: Write aisle number next to grocery on list, using spacing to leave room to add items. Step 5: Each week, add any items that are not already on the list. I buy some things only every now and then or monthly, but when I find them in the store, I make a note to add them to my running grocery list. In the example above, I did that with raisins. There is no reason to spend oodles of time shopping. A simple custom-made map of the store will be worth the time investment. Today, grocery shopping took less than an hour! As an added bonus, this list makes a great reminder of what you might need at the store.